Per neighborhood queries, we have obtained a copy of the conditions attached to the re-zoning of the property located at the old driving range (Grand Slam Golf and Baseball, 3352 North Druid Hills Rd.). This re-zoning was approved on January, 2017. 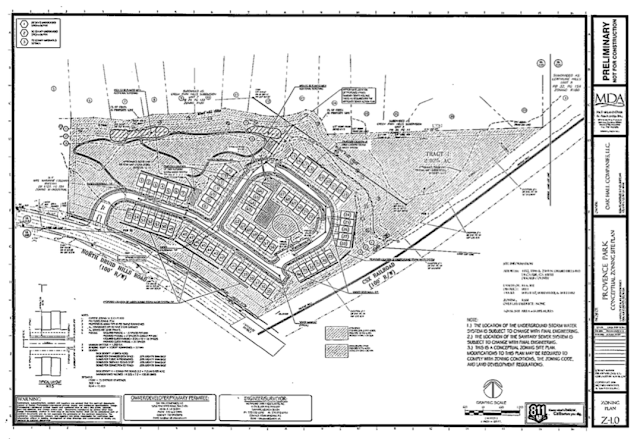 Rezoning conditions were negotiated by the Leafmore Creek Park Hill Civic Association (LCPHCA). The development will include 72 townhomes. Three acres of land at the property's east end (by Burnt Fork Creek) will be placed in a conservation trust and protected from future development. Additional permits will be needed before the driving range closes and the property is redeveloped. Image from re-zoning document (pdf), January 2017. The list of conditions and associated documents can be accessed here (pdf).